Mix all ingredients into mixing bowl to marinate for at least 3 hours. Arrange the chicken wings on a aluminum foil, bake at 200°C for 50 minutes. 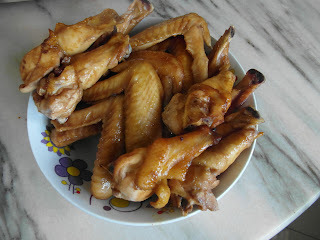 Turn the wings during half way during baking. I have used this method to cook chicken wings before. Yours look delicious. Thanks, this method is straight forward and easy...I did this same method almost every month although I am only a weekend house wife..